It was years later, after a stint as a rocket engineer, that Fruchterman cofounded a venture capital–backed tech company called Calera Recognition Systems. There he helped invent the first successful machine that could read just about any printed font without requiring human training. The products based on that technology had many commercial applications, but he hadn’t let go of his earlier idea. Soon he and the Calera team began prototyping a reading machine for the blind. When the machine was presented to Calera’s investors, they were impressed that it worked. However, they didn’t want Calera to pursue it. They had significant capital in the company, and not only was the machine projected to generate negligible profits, it would also take the focus away from developing more profitable products. It was then that he realized his dream didn’t fit in with the model of a for-profit tech company. So he decided to start a nonprofit. In 1989, Benetech was born with a business model intended to keep costs low for users, and the organization quickly became the largest maker of affordable reading systems for the blind. 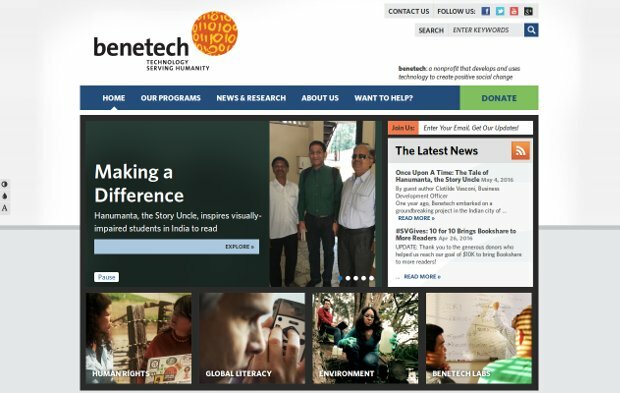 Today, Benetech continues to be a different kind of tech company – one with a pure focus on developing technology for social good.